Vision Zero is a ground-breaking political and social approach, born from the Swedish project of road safety, with the purpose of reducing deaths and gory impacts between vehicles and protagonists of urban traffic since 1977. Vision Zero revolutionizes the point of view on accidents, because it is the vulnerability of the human body, and not the power of the impact, which becomes the fundamental parameter on planning the transport and transit system. Responsibility, shared among those who travel and those who handle streets and traffic. Safety, being mindful about the possibility of human error. Road safety depends especially on the management of the transport and transit system, while human beings make mistakes, the road system, together with rules and innovative instruments, must not have any weaknesses. Vision Zero has the goal of eliminating all road accidents and serious injuries, promoting a secure, healthy and fair approach to mobility, so that everyone can experience road in safety and serenity. “Zero Victims” is the one objective which must be reached, and to do so no collision can be tolerated. The sideguard system can be lifted and left open without much effort for an easy access to the bottom part of the vehicle in case of maintenance operations or to reach the toolbox. The sideguard system is very light, indeed the lightest of the kind. Moreover, it takes 50% less time to be installed. 1. Possibility to find any solutions to be fitted for each and every type of vehicle. 2. Dedicated assistance directly on site. We have been saving lives since 1989. Thanks to our side guards systems we can make roads safer, because we are specialists in the sector of lateral protection industry, according to the European and USA legislations and because we produce side guards since 1989. The most common truck crash is a side-impact crash, where a large truck is turning and collides with a pedestrian or cyclists on the side of the vehicle. During a crash with a truck that has high ground clearance, vulnerable road users can fall into the exposed space between the front and rear wheels and suffer fatal crushing injuries. The side guard works by physically covering the open space between the front and rear wheel. One can be installed on existing or new trucks. Pedestrians are the most common victims of road accidents: in the city of Los Angeles, for example, pedestrians are involved in only 8% of the collisions, but in 44% of the cases, they lose their life; furthermore, road accidents represent the main cause of death of kids between 5 and 14 years old, finally every day there are 95 collisions between vehicles and pedestrians or bikers. In the city of New York, thanks to the adoption of the Vision Zero project, the deaths of pedestrians and bikers dropped from 170 victims in 2013 to 67 in 2016. This proves that road accidents and the deaths of the weakest are not a normal consequence of city traffic, but something that can be avoided thanks to rules and lifesaving devices. We, at Takler USA, produce, thanks to 30 years of experience, easy to install side guard system, which can adapt to any type of commercial vehicle. They are manufactured with high quality material, resistant to any type of atmospheric condition. Our devices are composed of stainless steel and hot-dipped galvanized steel brackets; rails and heads in aluminium, because we only use high quality materials and advanced technologies to conduct easy and fast assembling on each vehicle. 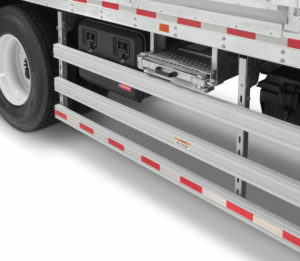 Our lateral protection systems allow you, besides managing space underneath the loading floor thanks to the adjustable brackets in 4 different angles, to easily reach all the accessories built on the chassis. How do I buy these- click on request code, we will get back to you with a quote as soon as possible. GET NOTIFIED OF ANY NEWS!